With a proud heritage, dating back well over 200 years, the name Tennants has stood the test of time and continues to service the construction industry with quality products its customers can rely on. 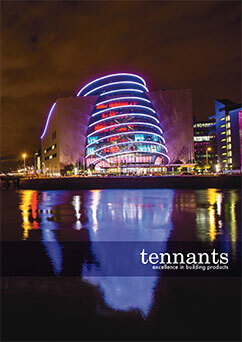 Tennants Building Products is part of the Tennants Group of companies, which was originally founded in 1797. With an eye on growing markets, the company established trading operations in Belfast (1805) and Dublin (1810), and over the years has expanded its scope to become a leading specialist distributor on an all-Ireland basis. In 2017 Tennants also acquired Walls and Ceilings International Ltd, with depots in Alcester and Bristol. Over time, Tennants Building Products has developed strong relationships with the manufacturers of specialist construction products and now boasts successful partnerships with leading industry names, to ensure that you, the customer, get the top quality products you need, and have come to rely on, from Tennants. We specialise in six core areas – drywall, ceilings, fire protection, insulation, acoustics and external façades – and by concentrating on these sectors we have been able to develop an enviable, and largely exclusive, portfolio of products for both the specialist and traditional contractor. As a result, we are now recognised as a leading expert within all six of these areas. At the very heart of our business lies a firm focus on customer service and we consider the expertise and industry knowledge of our staff to be a vital part of our continued success. Our extensive technical expertise covers the specification and performance of our extensive product range, and you can rely on the team from Tennants to offer sound advice and information to keep you right when specifying or installing a product – it’s all part of the service. At Tennants we believe we can help right from inception, throughout the design stage and on to delivering the right product at the right price. We will ensure that no compromise is required in order to achieve your vision and goals. We pride ourselves on our knowledge and technical ability to assist designers, specifiers and installers right from the very early stages, to choose the best products at affordable prices for each bespoke application. All criteria must be considered, from fire ratings to acoustics and thermal performance, when specifying for today’s demanding regulations and standards. We promote only products that can guarantee their performance and have proven longevity. We therefore offer total client satisfaction and can give you the peace of mind that you have chosen the right partner to engage with, time and time again.